I dont know why Jim Murray rate this 93 point, but i have to say i am a bit disappoint on this one. for this price (i paid about 10 euro for a 15ml dram) it lack of complicity. Wonderful example of how good Longmorn truly is. Juicy red apple, fresh berries and juicy grapes. Natural vanilla and vanilla root, a subtle creaminess on old oak and some tannings. Also some notes of old whisky showing. Oily and creamy, very thick with baked apples, stewed pears, and a touch of red grapes. Soft wood notes add a gentle spice. Long and gentle, lingering forest fruits and long wood spice. 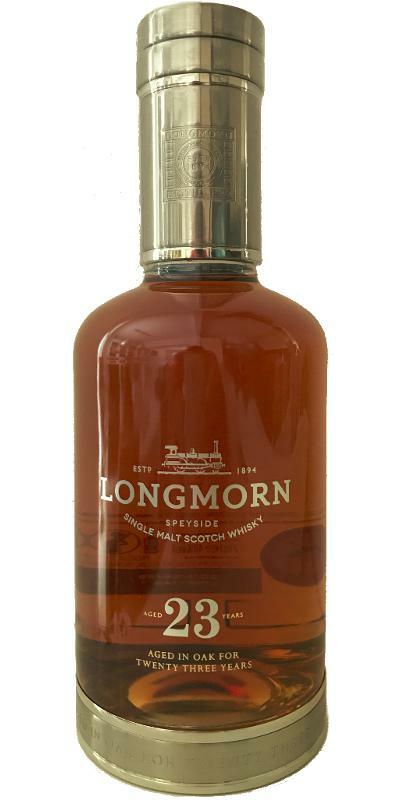 Jim Murray has awarded 93 points to the Longmorn 23 year old. N: More refined than the Rothes WB. A dryish though also hugely squidgy fungal sweet malt with sweet tyres [though this could be from the previous Glenrothes of course]. Good good, either way. T: Dark & deep woody fruits and steeped vanilla indicate this is an old, deeply matured 23yo - not many tired refills here. F: The squidgy malt never gives up being, er - squidgy. Tasted this yesterday at the Whisky Festival Gent for 5€ so I can't see why this should go for 1,3k €..
founder put into its creation.